WHEN I was two and twenty years of age, in the Year of our Lord Seventeen hundred and Ninety Eight, I was accepted as a Ship's Surgeon aboard the HMS Zealous, a 74-gun ship of the line, under Captain Samuel Hood. While aboard, that first year I met and befriended Midshipman Thomas Cuthbert... those of the Midshipmen's berth all called him 'Cuddy'. Cuddy was a most amiable fellow, well read and quite proficient as an officer, we were even about of the same age. He could laugh at nigh anything. There was nothing that he could not gamble on, he must have lost three years wages over the course of our service together. And a stout lover of mirth and good liquor. 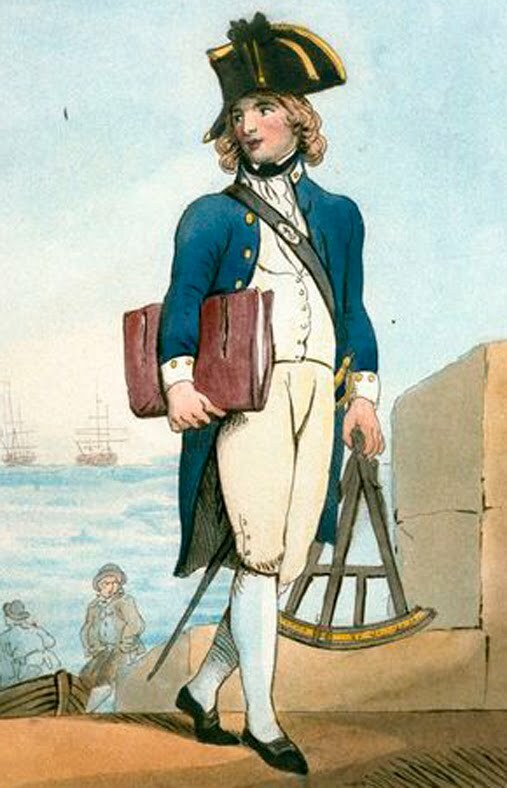 He was every bit the spitting image of Thomas Rowlandson's vision of a midshipman circa 1799, he even had the long golden locks. Cuddy became so intoxicated that I had to carry him on my back to return us both to the ship. On the way, I lost my footing and staggered, tumbling into the gutter. We both had bits of filth in our hair and on our faces, and I completely ruined the sleeve on my nice blue jacket. The splash in the face was just what Cuddy needed, and he woke up laughing. I implored him to rise, and together, we made our way back to the docks. We eventually made it back to the ship via long boat, stinking of alcohol and the gutter. The Captain stopped us before we could attempt to climb up the side, claiming he could smell us from shore. Says he, "What has become of your cloathing Gentlemen?" I, being the more sober of the two, called up the side, "We met with a bit of misfortune in town, and had a spill in the gutter Sir." "You gentlemen may not board until you've had a bath to wash off the stink." Captain Hood exclaimed. Cuddy, who was always very obliging, immediately stripped naked and dove into the water there by the ship. What could I do but join him? And do you know, Captain Hood even had the bosun throw down a bit of soap to aid in the process.